What is the best bonsai soil for your trees? The answer is: it depends on your plant species, your location, local climate, etc. There’s no single ideal soil for bonsai cultivation. Good water-absorption – the soil must retain enough water to provide sufficient moisture to the tree. Good drainage – the soil must drain properly to avoid making root rot. Good aeration – the mixture should have no fine dust, which would inhibit air movement through the soil. If you are willing to know more, then soil mixes should also meet other complicated requirements such as: esthetics, constant temperature, pH neutrality, ideal conditions for ion exchange, development of helpful bacteria, and ease of nutrient application, etc. All these, however, are almost beyond our common understanding and not discussed here. Generally, bonsai soil include two main components: organic and inorganic substances mixed in a certain ratio. Organic substances come from living things such as bark, sawdust, peat, animal manure, compost. As these organic materials decompose, they release the nutrients necessary for trees’ growth. Inorganic (inert) substances come from things that have never been alive and contain no nutrients. These include clay, volcanic rock, sand, gravel… providing minerals and air pockets in the organic materials. The air pockets in turn provide drainage of excess water and place for the gaseous exchange necessary for the roots to do their job. Poultry Grit - fragments of crushed granite which farmers feed to their chickens to help them grind up corn. Construction Gravel – basically river rock. Some bonsai experts suggest the ratio of 3/1, which means 75 per cent inert aggregate (rock of one kind or another) and 25 percent organic materials. What aggregate and what organic material becomes a matter of personal choice, depending on the availability in each area. Using local resources will allow the grower to keep costs down and hassle to a minimum. Interestingly, I find out that the composition of bonsai potting soil described above is quite different from that of the sticky black potting soil that I myself and most people are familiar with. Not like normal soil, such well-prepared soils are coarse, granular, well meeting the requirements (good water retention, drainage, aeration) of a tree living in a small confined pot. Besides above discussed materials, for personal preference, plant growers may choose to add some additives to serve specific bonsai species as long as these additions do not prevent efficient drainage. For example: for plants that like alkaline soils, the addition of one or two handfuls of horticultural lime is a useful addition. Green moss is also a decorative supplement to make soil surface more artistic and beautiful. An easy and simple way is buying soils at bonsai stores, where potting mixtures are well prepared in packages. Yet, if you are daring enough, then it’s pretty interesting to make your own potting soil and find perfect recipe for your trees. Preparing your own soil is somewhat trial and error process, but it improves your bonsai technique is worth trying. 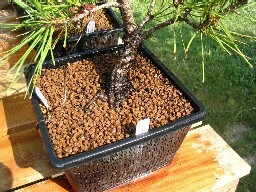 Besides, this DIY activity help saving cost as your own made soil is much cheaper than pre-made bonsai soil from stores. In fact, there is no specific way to make your bonsai potting soil and enthusiasts usually use their own blending formula. As discussed above, however, remember that the best general combination of components will be 75 percent inert aggregate material and 25 percent organic material. You choose types of organic and inorganic substances so as to take advantage of local availability and convenience. You can also amend these ingredients or alter the ratios to suit your own specific growing conditions. For visual reference, you may want to watch below video about making soil. Enjoy your watching and passion!